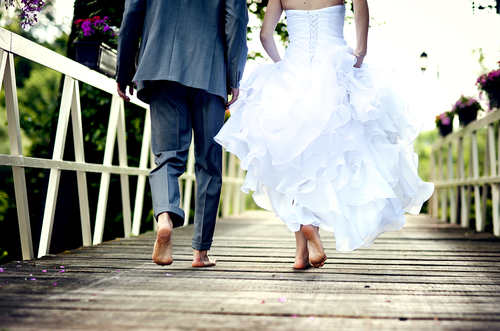 Your wedding is an amazing day that you will remember and cherish forever. Many brides turn to the Web to help share those memories, and a website of your own is definitely better than an album on Facebook. As overwhelming as it may sound, it’s actually pretty easy to make your site an amazing place to capture those special memories. If you’re experienced with web design, by all means go out and spin together an amazing website to hold your treasured memories. But if you’re not, there are plenty of ways you can do the same without a lot of knowledge of the inner workings of how a website works from the back end. Blogger is a popular choice because you can access and build using your Google account, and its online tools are easy to understand. There are other options too, like Weebly or Web.com that have similar easy-to-use tools and templates. Once you’ve decided which website builder you’re going to work with, plan out how you want to tell your story. For example, you can make separate sections for the wedding, reception and honeymoon. But don’t forget the rest of the story, either — how you met, where you were when you decided to get married and how you chose your honeymoon spot. Simple pen and paper may be your best bet for making a quality website outline — it is more concrete that way, and you won’t have to stress about making it all fit and look good while pounding away at a computer. You can compose your story within your site’s online web builder, but it may be easier to do it in a separate word processor, so you can look over your work before you post it on your site. You can choose to wait to publish everything until it looks exactly how you’d like, or maybe you prefer to publish pieces of your site one at a time. Either way, it’s up to you, but taking the time to explore all the details of your happy nuptials and (almost) everything that came next can really make your wedding site amazing. In addition to current pics of you and your fiancé, sift through photos of years past. Many couples choose to show a slideshow of themselves as children during the wedding or reception, but they make a great addition to your website as well. In addition to providing wedding details, share the story the two of you wrote over time. Another idea is to post a few funny pics — outtakes, candid shots of family and friends or Uncle Bill’s big spill. The beginning of your married life should be beautiful and carefully planned out, but life can and does happen — don’t forget to remember those times, too. In addition to the pro shots that your wedding photographer or videographer captures, you can really help your wedding video stand out by mixing in some professional video images that help tell your unique story. The good news is that you can find backgrounds, themes, nature and art on sites such as Shutterstock. Adding a few professional videos can really round out what you’re going for as you create the memory of a lifetime.